Welcome to The Lash Lounge a small boutique that provides professional quality eyelash extensions. Specializing in the Volume Lash technique. 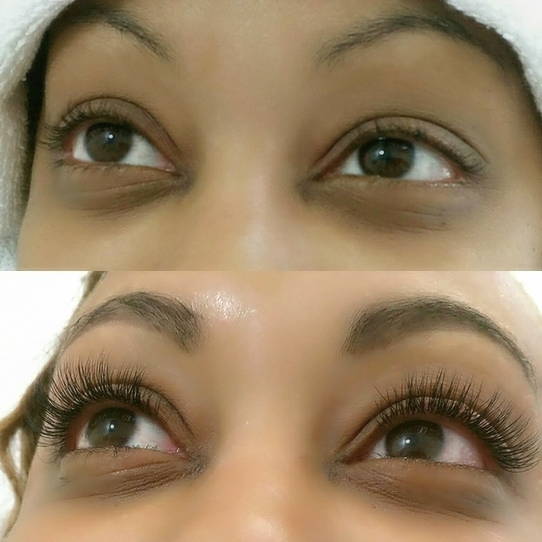 The Lash Lounge's technician has been specialized in eyelash extensions for over a decade and certified with Xtreme Lashes Inc. and other well known companies. Makeup Artistry and Skincare are also her passions. Eyelash and overall eye health is always a number one priority! We will work as a team to maintain great eyelash health while wearing extensions. Classic Eyelash Extensions are 1-1 lash with synthetic mink tapered to mimic the natural eyelash shape. Customized and "lash-mapped" for eye shape and your preference. Lengths of 7mm-15mm with diameters of .012-.018 and curls of B,C, D and L curls. Volume Eyelash Extensions is the advanced technique in application. This method involves applying fine handmade fans of 3D-5D using the 0.03mm - 0.07mm lashes each to one natural lash. 200+ lashes per eye can be achieved. Your natural lashes strength determines how many dimensions can be added per lash. Volume lashes are best suited for most clients as they are feather light. You cannot wear mascara with volume lash extensions. Please see prices in Services, or contact for details.